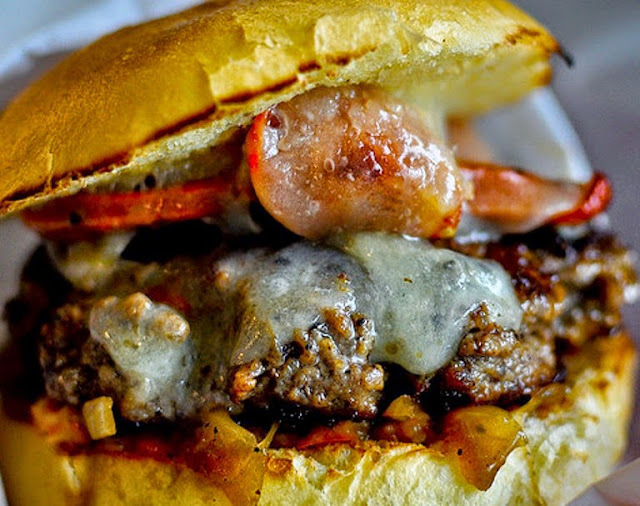 "An extremely flavorful Spanish style burger made from beef and Spanish chorizo sausage, topped with caramelized onions and smoky red pepper ranch sauce and shavings of Manchego or cheddar cheese served in buns." 1. In a large bowl, mix together the ground sirloin and chorizo using your hands. Set aside to let the flavors blend. 2. Heat one tablespoon of oil in a skillet over medium-high heat. Add one chopped onion, and saute until tender. Transfer the onion to a blender, and add the red pepper, Ranch dressing, saffron, and paprika. Pulse until fairly smooth. Refrigerate until needed. 3. Heat the remaining oil in a large skillet over medium heat, and add the remaining onions, brown sugar, salt and pepper. Cook and stir for about 15 minutes until the onions are golden brown. Set aside. 4. Preheat the grill for high heat. Form the meat into four patties, slightly larger than the buns. 5. Place burgers on the grill, and cook for 5 minutes per side, or until well done. Split buns in half, and spread butter on the inside. Place on the grill to toast briefly. 6. Place burgers onto buns, and top with caramelized onion and the roasted pepper ranch sauce. Sprinkle with a few shavings of manchego cheese, and place the top of the bun on top.